Beach bats, bat and ball or bats. Anyway you look at it, the best way to enjoy fun in the sun! We are starting a collection of the best beach bats pictures... from around the globe. If you are an avid beach bats player and have awesome pictures you would like others to see - please send them to us and if they are suitable we will add them to our website. This beach bats fanatic comes from Cape Town, South Africa and is pretty partial to this awesome country and our beautiful beaches. So if you want to experience some of the best beaches in the world, check out Hotels and Accommodation and Car Hire and start planning your visit. 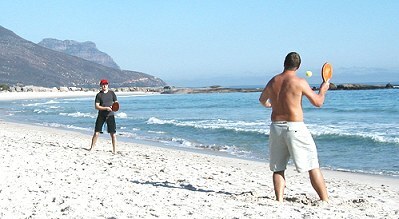 Photographs on this website copyright South Africa Tourism & BeachBats.com| BeachBats.com © Copyright 2003-2004. All rights reserved.